Salmon Roe is an ingredient that can be harvested from jumping salmon in streams (non-jumping and dead salmon do not carry any). 1 guaranteed sample can be found in up to 3 locations. 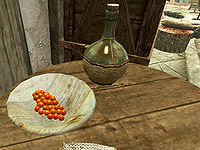 Salmon that swim in shallow water (areas that are marked as pond water), such as the area near the East Empire Company Warehouse near Solitude or the fish hatchery at Windstad Manor, will yield salmon roe when "killed". They will not yield roe if they are simply harvested. The waterbreathing effect of salmon roe is valued at 15.4 times higher than it is for other alchemical ingredients. Thus, any waterbreathing potion with roe as a component will be extraordinarily valuable. The Fortify Magicka duration is only 5 seconds, while the Waterbreathing effect is 60 seconds. These values appear to have been swapped with one another, as Fortify Magicka is normally 60 seconds, while Waterbreathing is normally 5. This page was last modified on 30 August 2018, at 16:15.